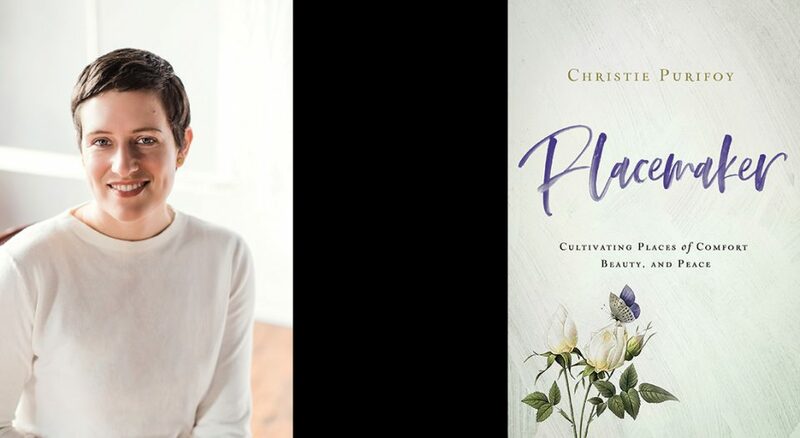 Christie Purifoy’s new book Placemaker: Cultivating Places of Comfort, Beauty, and Peace (Zondervan, 2019) invites us to notice the world around us and to create opportunities to share the gifts we find there. Purifoy’s first book, Roots and Sky (Revell, 2016), took readers through the church year at her farmhouse home, while Placemaker explores places she’s lived by focusing on the trees that grew around her. Living Lutheran spoke with Purifoy about place-making and what that looks like in a life of faith. Living Lutheran: What does “place-making” mean to you? And what does it mean for your faith? Purifoy: “Place-maker” is a term I landed on a few years ago to try to describe myself, to describe what connected all the various passions I had—writing, or gardening, or homemaking, or cooking, or baking bread or creating beauty. I had this sense that they were part of some whole vocation, but a word like “homemaker” was much too small and much too limited and too culturally weighted in various ways to account for it. So “place-making” is the term I landed on, and once I started exploring what that meant for me, I realized this is something most people really are doing and just need to have their attention called to it—to notice that the small, ordinary things they are doing actually are adding up to something really significant. That’s what I call place-making: it’s just about tending places, caring for them, remaking them, cultivating them, and then sharing them with others. I really believe this is part of God’s character, so it’s in our divine DNA. It’s something that we have received from the Creator who made us. When we do this thing called place-making, we are living like our Creator because he cares for places, he made places, and Scripture is full of the places that were special to him. When we tend our own special places and share them with others, we are following in God’s footsteps. One of the threads that runs through your book is the idea that the world and everything in it is impermanent, and that loving and cultivating gardens, homes and relationships are all a risk. Could you tell us what you’ve learned about that? It’s one of the most painful realities for me: I love so deeply, as many people do—whether that’s a person in my life, or a place, or a garden I’ve made or the beauty of a flower I’ve just cut this morning—but I know that all of those things are passing away. Whether it’s losing someone you love to death, or moving away from a home you love, or having to dig under a garden you planted, these things don’t last forever. The tendency for me has been to despair and say, “Well, then, why bother? Why bother loving? Why bother planting? Why bother if it’s just going to end in death? If it’s just going to end in winter?” I know that logic is flawed. My faith has given me a language for dealing with that, but I still have to write my way through the conundrum. That’s really what I was doing in this book, to try to glean what makes it worthwhile. Why is it worthwhile? Those are the questions I was asking. … I could say, long story short, that while it’s absolutely worthwhile, it doesn’t mean it won’t be very painful. It’s painful to love and lose. It’s always going to be painful, but it is worthwhile. When we tend our own special places and share them with others, we are following in God’s footsteps. What advice would you give to those who are new to the idea of place-making? I think—and this is something I think I go into in the book—listening to a place. We have to start from a place of humility. It was always so easy for me to go in and think, “I’m smarter than these trees. I’m smarter than this place. I can look around and know what’s best. I can figure out what to do.” But that’s just a recipe for disaster. An encouragement, if you’re feeling like “I don’t know how to take care of a place; I don’t know how to improve it or make it more beautiful”: that’s actually a good place to find yourself because that’s the kind of humility that will serve you well as you try to notice and listen, figure out what’s already there, take care of what’s already there, find out about the history or the past of a place, and tend its history and what it has been in the past. Those are things that we can only do from a posture of humility and a sense of our own smallness. Maybe that, too, is another reason I wanted to write about trees: There’s nothing like a giant old tree to make me really feel that Scripture that talks about human life as a vapor, a grass, a flower, just this wisp; standing near a big old tree, you feel that. I think that humble place is a good place to be for wisdom and for wise place-making. Most people are familiar with the concept of hospitality, but place-making goes beyond that. What do you see as the relationship between the two? I think hospitality is part of [place-making], but it doesn’t encompass this. What we’re talking about is actually bigger than hospitality. I picture a Venn diagram: Hospitality definitely overlaps with place-making, or perhaps it’s even entirely within the circle of place-making, but there’s also a whole lot else going on. For me, what it looked like is that I had often thought of myself as someone geared toward hospitality and maybe even gifted toward hospitality. But at the same time, as an introvert, hospitality was always very hard for me, especially hospitality that looked more like entertaining. So what this concept of place-making has done for me is honor what I do when I’m alone, whether it’s tend a garden, or sweep a floor or bake a loaf of bread. Place-making says, “This thing you’re doing is also for other people, even if those other people aren’t here with you right now.” So when I tend the garden, for instance, I do that mostly alone, but I do it knowing that some other person is going to come visit that garden and maybe sit on that bench and maybe smell that flower, and I like to think about that. So in my mind, I am making a place for them, I’m not just doing it for myself. But at the same time, if they come to visit my garden, I might slip away inside and just let them be in the garden. It’s a kind of hospitality that is really ideal for introverts like me. I tend to think of place-making as the broader way of seeing hospitality, in a way that invites all of us into it whether or not we love having people sit at our table or come over to our house. What are your hopes for your readers? I hope my readers will realize that beauty is enough, that it matters—and that if they’re drawn to it, they want to create it, they want to make more space for it in their lives, and that’s a worthwhile thing to do. I think too many of us have a more utilitarian mindset. We think things are only of value—whether it’s spiritually or personally—if they’re useful in some way. Beauty too often just looks like this extra thing that isn’t maybe strictly necessary. That’s the primary thing … having read the book, that they are willing to make more space for beauty in their lives. I think that would be more than enough.